If you or a loved one is suffering from a drug addiction, it can be scary and even seem overwhelming. Luckily, there is plenty of support and treatment centers to fight a drug addiction. No one sets out to be an addict, but you’re not alone: about 21.5 million Americans just like you also are fighting a substance use disorder. There are lots of rehab facilities in or around Fayetteville, Arkansas to help. Drug addiction affects people whether they are rich or poor, and suffering from an addiction does not mean you are weak or lazy. In fact, even recognizing you have an addiction takes tremendous courage, and entering the treatment process and sticking with it takes even more strength. Read on to find out more information about drug abuse in Fayetteville, Arkansas, as well as what to expect from treatment and rehab. ○ Hallucinogens, club drugs, etc. 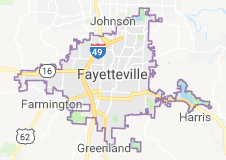 The biggest problem faced by Fayetteville, Arkansas is methamphetamine. The DEA reports that Arkansas is 17th in the nation for meth lab busts. The Arkansan police also reports many crimes linked to meth, and in general, meth is linked to about 70% of property crimes. The long term effects of meth addiction are disastrous and it’s not an exaggeration to say that meth addiction can ruin or end your life. Common effects include depression, psychosis, violent behavior, suicide, major financial loss, jail, and even death. There is also plenty of physical effects such as heart disease, liver damage, kidney damage, and even brain damage. Another troubling long-term effect is that methamphetamine abuse often leads to a destruction of personal relationships. Is Drinking or Using Dominating Your Life? Below is a quick survey you can fill out to see if you are addicted to alcohol or drugs. Simply read the question and answer yes or no. 13. If you answered yes to the above question, have you ever needed to increase the amount you took in order to get the same effect? If you found yourself answering “yes” to most of these questions, then continue reading to see what the treatment and rehab process is like, as well as to see a list of which treatment centers are closest to you. Below are the different steps associated with treatment. Continue reading to learn more about Assessment, Pre Intake, Intake, Detox, Types of Treatment, and Aftercare and Sober Living. ● This is where a medical professional will use different questions and tests in order to learn more about you. Assessment is used to decide if treatment is necessary, and if so, which kind would be best. It can also be used to help determine if you, loved ones or friends have any other disorders that are occurring at the same time (for friends or loved ones, examples are codependency; for the addict, an example is an addiction to a another drug or a mental health issue). ● This is simply the process before intake, and typically consists of filling out a few forms and tells you which documents to bring and usually asks for some medical information. ● You will meet with a therapist/doctor/psychologist and go over their mental health and medical history. All information will be kept private, and it is in your best interest to be as honest as possible in order to receive the best and most effective treatment. After all, everyone is different, so ideally this step is used to ensure you get the treatment that will help you the most. ● This is where your body gets rid of all the drugs in it. In order to go through a safe detox, it is vital that you seek help from a medical professional. In fact, detox at home can be more painful and even deadly. A medical professional can prescribe medicine to relieve the symptoms of withdrawal, and ensure you are in a stable and safe condition. They will also provide support through this difficult time, and help you find healthy coping mechanisms instead of relapsing or medicating in a potentially harmful way. ● Residential Treatment Program (RTC) or In-patient: Stay for around 30 days at an in patient center where you learn how to treat and recover your addiction. Because you will be away from your normal environment, you will be able to focus completely on recovery, and learning healthy new strategies, especially with support from medical professionals around the clock. ● Partial Hospitalization (PHP) or Outpatient: Allows patient to have more flexibility, but you must also be responsible and choose to stay away from drugs when you are not in outpatient sessions. However, there is still plenty of support from medical professionals and support groups, and you may live at home if you wish. ● Intensive Outpatient Program (IOP): This option is for those patients who need the least amount of medical support, and are able to choose to stay away from drugs when they are not attending the program (which typically meets three times a week). ● While people don’t always think of this step, it is absolutely vital that you continue checking in with yourself and stay vigilant against cravings and urges. After all, powerful cravings will occur for years, and it is okay to ask for help. Many treatment centers will provide aftercare, but there are also support groups, as well as individual therapy with therapists or counselors who specialize in recovery. Online therapy is also an option, especially if money or a busy schedule is a concern. Now that you know more about each step, hopefully rehab and treatment is not such a scary or overwhelming idea. If you are ready to take the next step and get started in your treatment process, call us for a list of treatment centers near you. If you are ready to get help but money is an issue, do not worry. There are plenty of options in case you need help but might not have the financial means. Remember, detox at home can be excruciatingly painful and even deadly, as well as have a big risk of relapse, so it is definitely worth is to get support from a treatment center or a support group. ● State Funded Assistance: Check out the Directory of Single State Agencies (SSA) for Substance Abuse Services which was put together by the Substance Abuse and Mental Health Services Administration. It lists different contact information for each state so you know who you can contact to find out more and take advantage of the resources your state has put together for battling substance abuse. ● Insurance: Depending on your insurance policy, you might have more or less coverage, so talk to your provider and see if your insurance policy can help cover some of the costs. ● Support Groups: These programs are usually free and members know exactly what you are going or have been through. Of course, they aren’t designed to be a substitute for a treatment center, but they can certainly offer plenty of much needed support, and keep you on track for recovery. You can always call us. We have access to financial support options and caring, supportive guidance to help you find the best treatment facility. Are You A Concerned Loved One? Addictions can be devastating, not just for the addict, but also for friends, parents, children, spouses, and other family members. First, keep in mind that as much as you might want to help your friend or loved one, ultimately, the addict is the one who must take responsibility for their addiction, and they must make the choice to battle their addiction. No matter how much you love someone, unfortunately you cannot force them into treatment or avoiding relapse. You can certainly work with medical professionals at the treatment center to help support your friend or loved one. For instance, perhaps a medical professional will advise you to help your friend or loved one avoid triggers. That being said, one problem that friends or loved ones of addicts often suffer from is codependency. Codependency is a destructive learned behavior where friends or family members feel responsible for the addict’s behavior, and tries to control their behavior. Codependents tend to be people pleasers, and stay in relationships because they believe people need them. They often have trouble figuring out what they are feeling, and if the addict is upset, then this impacts their own mood negatively. If this sounds like you, go ahead and check out CoDa.org to learn more. There is therapy as well as support groups and 12 step programs to combat codependency. After all, how can you take care of other people if you haven’t taken care of yourself first?